The Stanley Cup Playoffs kick off with five games on Wednesday night and three games on Thursday. The puck drops at 7:30 on Wednesday night at PPG Paints Arena as the Pens take on John Tortorella and the Columbus Blue Jackets. 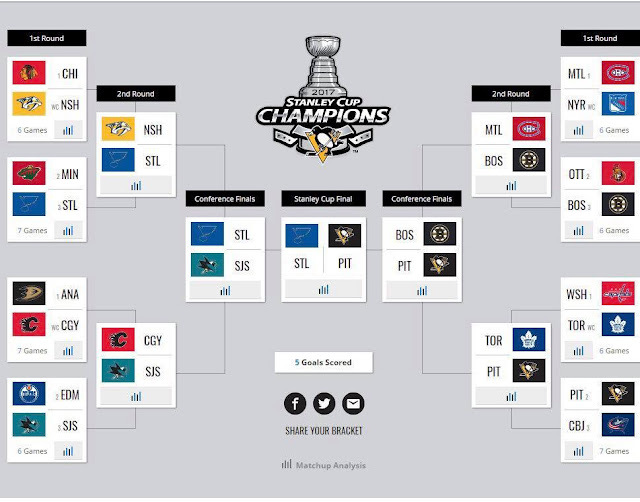 The Pens Initiative staff took at stab a predicting how the next couple months will play out. SPOILER: Our Stanley Cup Champions were not unanimous. We used a variety of methods to make our picks including analysis, research, coin tosses, asking our cats, and the classic and reliable eenie meenie miney moe. Head over to the NHL Bracket Challenge to make your picks, though I can't promise the site hasn't imploded by now. 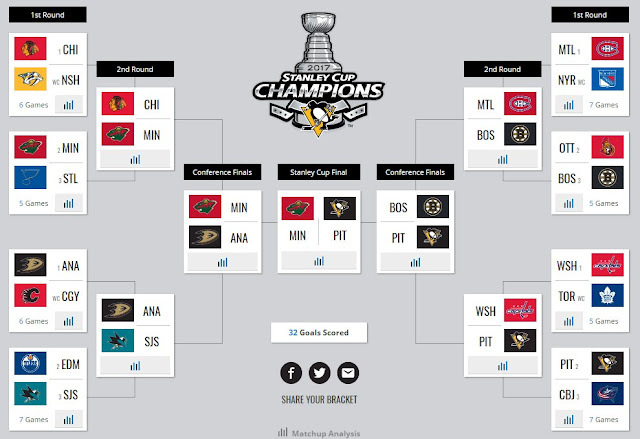 As I wrote last year, it's fun when the head and the heart can be in alignment when filling out the playoff bracket, and the Pens ability to go on a tear was evident to anyone who had watched them play down the stretch. Now as Pittsburgh enters their Cup defense, there chances are more of an unknown compared to last year. The team hasn't had a strong stretch run, but they have played with half a lineup for portions of the last month and a half. Losing Kris Letang hurts, but the Pens will ice a solid blue line with great goaltending, and they have the potential to ice three dominant forward lines with a strong 4th line backing them up. A Stanley Cup repeat is still very much alive. Unfortunately, Washington also has a very strong team, finishing off a repeat of their own with a second straight Presidents' Trophy, and the Penguins would need to face them after what should be a taxing series against the Blue Jackets. 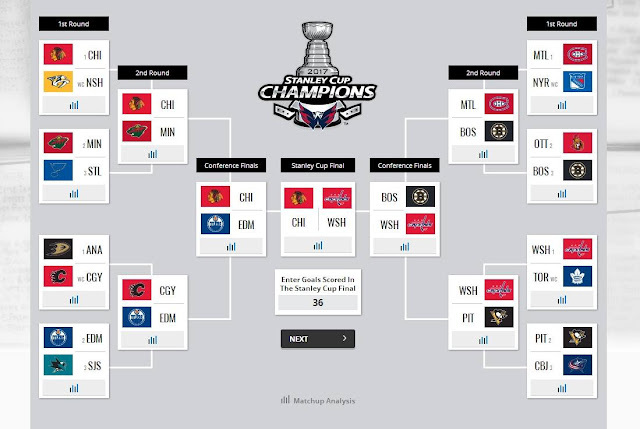 It's at this point that the head and the heart diverge, and the Capitals become the safer pick to advance out of the Metro region. 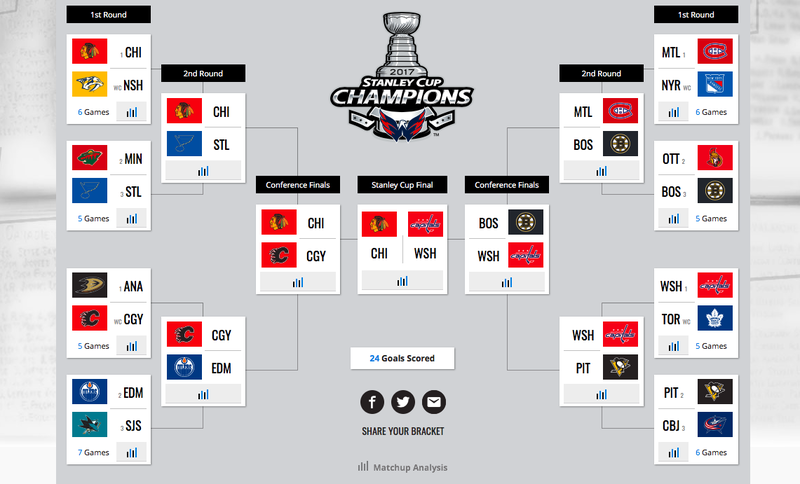 While it would be the first trip to the Eastern Conference Finals of the Alexander Ovechkin era, I wouldn't expect it to result in the Caps finally getting the banner they've long desired. After running through the Eastern Conference, they'll bow out in the Finals against a familiar face also looking to exorcise playoff demons. Bruce Boudreau has had his fair share of difficulties in the postseason, but in his first year in Minnesota he's guided the team to a under the radar stretch run that sees them lead the league in score and venue adjusted CF%, FF%, SCF%, and xGF% (via corsica.hockey) since the beginning of March. The Wild continue the strong play through June, knocking off the Capitals and bringing the coveted first Cup to Minneapolis instead of DC. The Stanley Cup Final no one wants to see (outside of Pittsburgh and Chicago). For me, this wasn't as cut and dry as it was last season. All signs clearly pointed to the Pens. 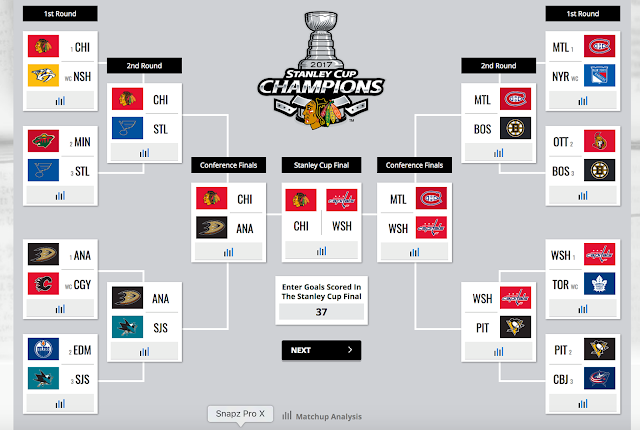 And I was one of the few who foresaw San Jose escaping the first round. I picked the Pens again but I'm struggling with that decision as I type this. Even without Letang (as the Pens have been throughout a lot of the season), if everyone else gets and stays healthy against physical teams who are out for our heads, the Cup is ours to lose. No doubt that Letang is an X-factor player, but we've got a stable of guys ready to shoulder the load. I'm also very reluctant to say this may be Washington's year. The Bruins will survive the lackluster Atlantic. That may be wishful thinking because I live in Boston now and want to see the Pens in person one more time this season. But I like the way the Bruins are playing right now. Or I've been brainwashed. I think the Sharks are going to resurrect their first round exit tradition. They've been on a skid. I know part of that was the loss of Thornton and Couture, but I know some other teams that have continued to battle after key losses. Calgary is young so I'm looking for them to go further in the future, but they're not quite there. I struggled with Chicago and Minnesota the most. If it's not Chicago, it'll be Minnesota. There is no good reason not to believe that the Penguins can't repeat this year. Yes, Yes, I know they are missing Letang and he is irreplaceable, but we also have 2017 Sheary and Guentzel which is a huge upgrade to our offense from last year. Plus, nothing would make me happier than defeating the Capitals ... again. It's hard to ignore the Blues and Ducks in the West. The Blues have gone 15-3-2 since March 1st, and the Ducks 14-2-3. It's hard to count out the Blackhawks but they have given up the 10th most shots int the NHL with 647 since March and their power play has sunk to 15.1%. They usually get it together for the Spring though. The Sharks and Wild have had LOSING records since March 1st, not really a good way to limp into the Playoffs. Other than the obvious choice of the Pittsburgh Penguins, I have no basis or fancy analytical reason on why I chose things the way I have. I looked at the pairings and went with my gut between them. The end result is literally black and blue...as the teams will be by the time they hit the finals. Let's Go Pens! It's with great pain and suffering I write to say that I believe that this is the Caps year. Why you ask? Well the East is hot trash. A hot Boston should steamroll New York and top Montreal (though that's a push) and neither of those teams could stack up to anyone in the Metro. The Penguins should take out the Jackets, who have been stumbling as of late. 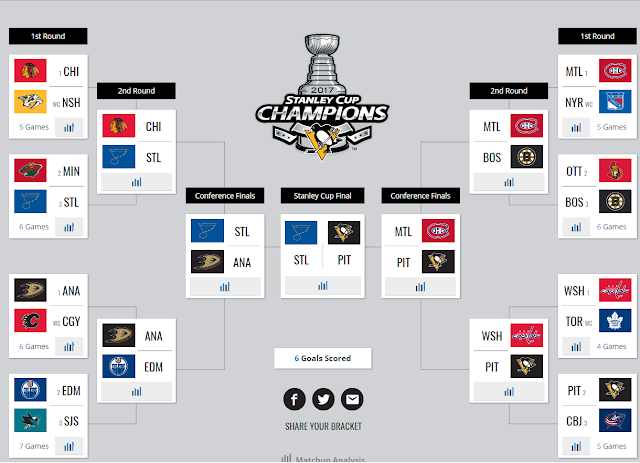 The Cup champion was always going to be the Metro winner... but the Kris Letang injury made all of the difference. In the West, the only real contender outside of Chicago is St. Louis. If it weren't for Pekka Rinne's rollercoaster season I could see Nashville making a run but I just don't trust him. As such, it continues my heavy heart of selection the Blackhawks to run through the West. All teams are pretty shallow or struggling at the wrong time (hi Minnesota) and it's, once again, Chicago's to lose. Calgary will make it fun, though. In the end it'll be the Caps cup to lose. You know the scene in Liar Liar where Jim Carrey tries to say the pen isn't red but he literally can't? That's how it felt writing that sentence. Congrats Ovie. You'll have finally done it. Without Kris Letang, I don't feel comfortable about picking the Penguins to win the cup. With Letang's absence, and two tough and PHYSICAL series likely ahead of them, it seems illogical to think that the remaining defensemen will stay healthy. Remember all of those blocked shots during the regular season? That's going to be cranked up to 11 and I can't help but think that someone else will go down. BUT, ask me again come conference final time and I might have a different outlook. I think the conference representative will come out of the Metro. That's when I started to believe things were real last year. I like the Blackhawks. Everyone has a mistress team, and the Hawks are a smokin' hot choice to be stepping out on the Pens with. Plus, they win it every other year, right? Having witnessed the 1a/1b matchup I dreamed about since I started watching hockey in the early 90s unfold last season, to expect a duplicate this season would be foolish. A massive part of me also would love to see the Predators take out the Habs on a PK Subban goal following a Shea Weber mistake in Montreal for the amazing awkwardness that would create for everybody involved, save the Predators. But this is reality. Have you watched the Blackhawks? That team is what we call in the Army "high-speed, low drag." They're lethal and don't make mistakes. Love them or hate them, they're beyond what most teams can handle, especially in a 7-game series. In the East, the Metro is ridiculously overpowered having 4 (count 'em, 4) teams eclipsing the 100-point plateau this season. The current playoff format is criminal based on that alone. And its what will be the undoing of the division. Until Washington beats Pittsburgh in the Playoffs, I refuse to believe that they can beat Pittsburgh in the Playoffs and the Pens are just too beat up to go the distance. I hope they prove me wrong. Let's go Pens. Everyone's favorite Penguins are the easy choice as to who will be kissing Lord Stanley in June. The Capitals always give us the pleasure of choking way before their allotted time and Sidney Crosby only likes to win. Can't wait to see 87 get number 3 so the argument that Kane and Toews are better "because 3" can be buried as deep as Ovie's chance of winning anything. I know, I know: I picked the Washington Capitals to win the Stanley Cup even though you can't spell "OVECHKIN" without "CHOKE." While I would hate to see Alexander Ovechkin finally win something other than an individual trophy, his team has an elite netminder and has played consistent, good hockey for 2+ years straight. While their blue line is suspect and could experience problems against speed (oh hi, Pittsburgh! ), if the Capitals can dictate play and convert on the power-play, Barry Trotz's annoyingly effective trap will stifle its fair share of opponents. As for the Western Conference...I actually envision the Oilers going out before the Conference championship, but their team speed is a nightmare for the older San Jose Sharks (again: oh hi, Pittsburgh! ), and I like the Oilers' chances against either Anaheim or Calgary. I do not, however, like Edmonton's chances against the Chicago Blackhawks, and it's certainly not because of Jonathan "ROMGZ L33T LEADERSHIP" Toews. Chicago has depth up & down its lineup, and the ability to roll lines versus Edmonton's singular Connor McDavid wunderkind line is a decided advantage to the Blackhawks. I hope I'm wrong, and I'd love to see the Penguins beat the Blackhawks (and Jonathan "LEADERSHIP!" Toews), but this year has all of the makings of Red Rocking. ...I want to throw up.